People walk past an electronic board showing exchange rate between Japanese Yen and U.S. Dollar outside a brokerage at a business district in Tokyo, Japan August 9, 2017. SYDNEY - Japanese and Hong Kong shares led Asian stocks higher on Wednesday, supported by optimism about global growth and as the Chinese central bank’s weekend move to free up liquidity boosted mainland financial stocks. Japan's Nikkei climbed to a more than two-year peak while Hong Kong's Hang Seng Index rose to a level not seen since May 2015. The Philippines Stock Exchange added 0.7 percent to a record high. 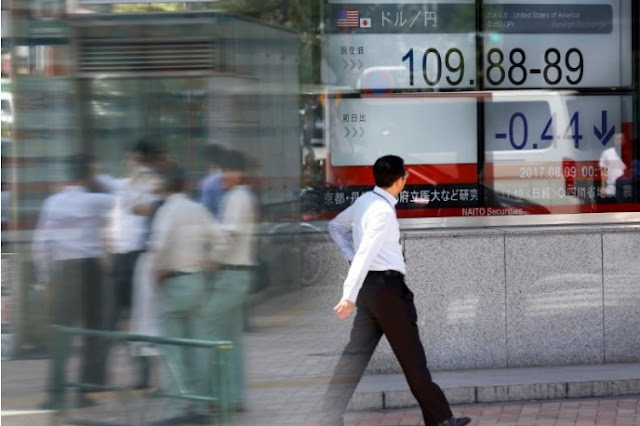 Across Asia this week, trade has been generally subdued and volumes thin with China and South Korea closed for week-long holidays, while analysts cautioned against reading too much into index moves. However, world equities have been underpinned by upbeat global data, including strong manufacturing activity across much of Asia, Europe and the United States, largely reflecting a broad export boom. MSCI’s broadest index of Asia-Pacific shares outside Japan .MIAPJ0000PUS climbed 0.3 percent to extend four straight days of gains. China - the world’s No.2 economy - has held up remarkably well this year, thanks to a construction-boom and surge in exports. The Chinese central bank on Saturday cheered investors by cutting the amount of cash that some banks must hold as reserves for the first time since February 2016. Analysts say the move by the People’s Bank of China should support banks’ net interest margins and profit growth in 2018. Predictably, financials lifted the Hong Kong China Enterprises Index, which soared to the highest since August 2015. China Construction Bank and Industrial and Commercial Bank of China were among top gainers. Asia already had a strong tailwind from buoyant U.S. shares, with the three major stock indices on Wall Street closing at record highs on Tuesday. Car sales in the world’s biggest economy grew at the fastest pace in 12 years as Americans rushed to replace cars lost to hurricanes in Texas and Florida in recent weeks. The car-buying spree will boost new and used auto sales through at least November, according to industry consultants. That will hoist retail sales, adding to the country’s gross domestic product and more than offsetting the drag from damage done by the hurricanes, analysts said. Britain's top share index FTSE 100 is set to open steady, according to spreadbetters, with futures FFIc1 a touch softer ahead of cash market open. In currencies, the dollar eased 0.2 percent on the yen to 112.61. The dollar index .DXY, which tracks the greenback against a basket of six major currencies, slipped 0.18 percent to 93.405. The foreign exchange market is at a crossroad with uncertainty over the likely successor of Federal Reserve Chair Janet Yellen whose term ends in February. Fed Governor Jerome Powell has joined the race for the job alongside his predecessor Kevin Warsh. “The market is still seeing Warsh as a favourite but the odds for Powell have improved. Powell is perceived as being a relatively dovish choice compared to Warsh,” said Ray Attrill, Sydney-based global co-head of forex strategy at National Australia Bank. As a result, Treasury yields headed lower to 2.3120 percent from a near three-month peak of 2.3710. Elsewhere, investors remained cautious over Catalonia’s vote to separate from Spain with the region’s secessionist leader saying he would declare independence “in a matter of days”. “The Constitutional Court is likely to challenge and rule against such a motion,” analysts at Citi wrote in a note. Catalans had come out in hordes to vote for independence on Sunday in a referendum that was declared illegal by Spain’s central government. In commodities, U.S. crude CLc1 dipped 0.75 percent at $50.04 a barrel on caution that a rally that lasted for most of the third quarter would not extend through the last three months of the year. Brent crude LCOc1 fell to $55.62 per barrel. Japanese and Hong Kong shares led Asian stocks higher on Wednesday, supported by optimism about global growth and as the Chinese central bank’s weekend move to free up liquidity boosted mainland financial stocks.